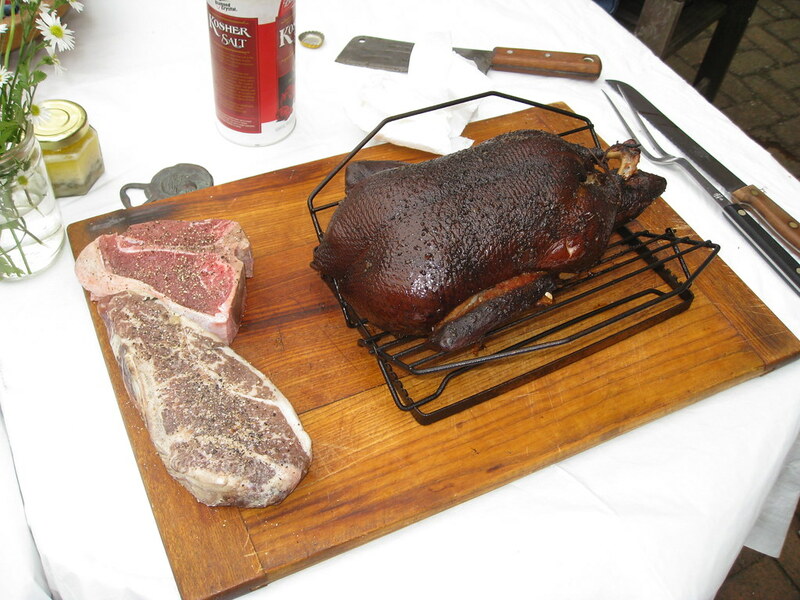 Cooked up a storm yesterday, beginning with the smoked duck you see pictured above (here’s a larger view and a different angle). That steak and veal chop you see there also made their way onto the grill, plus we had Carolina-style ribs, crisp-skinned pork belly, and roasted clams (forgot to photograph those), with peach pie and nectarine/mascarpone torte for dessert, all of which seemed to please the assembled masses. A very good day indeed. 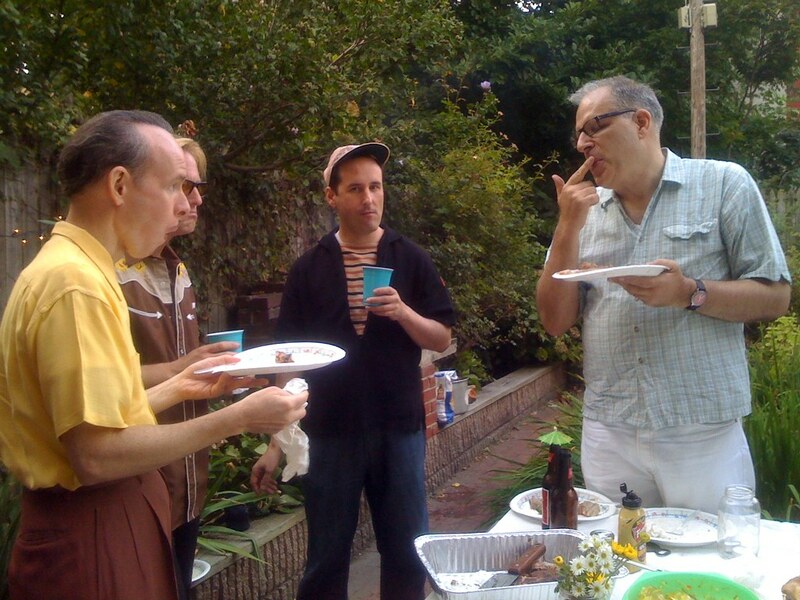 Dig the hot dog and mustard t shirt Paul. Where do you get one of those? 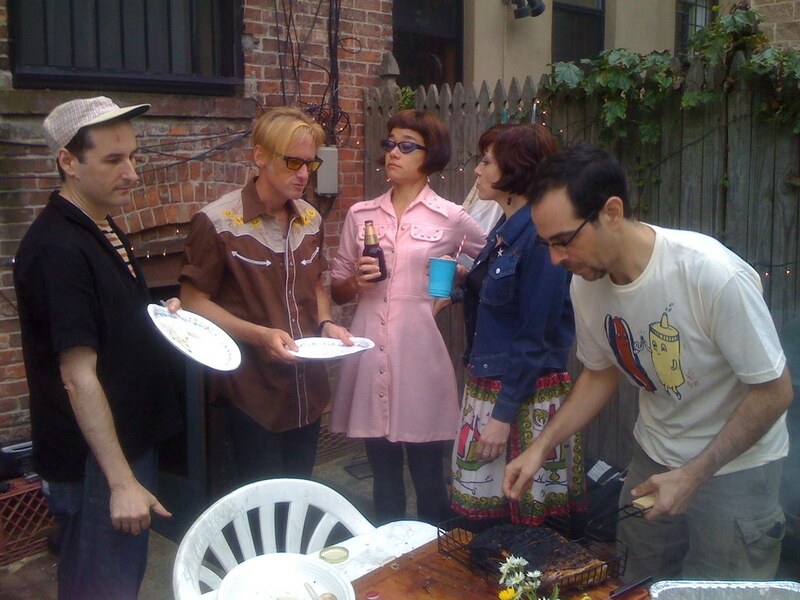 Have a great Labor Day, gang!!! The “assembled masses” look freaky cool. The link as to where to get one is in the comments on September 1 or 2. I didn’t feel like looking, though. I know you posted it before, but what smoker do you use. I have one but it’s a litte too small for my liking. I can’t smoke but some ribs, certainly not big enough for ribs, a duck, and pork at the same time. 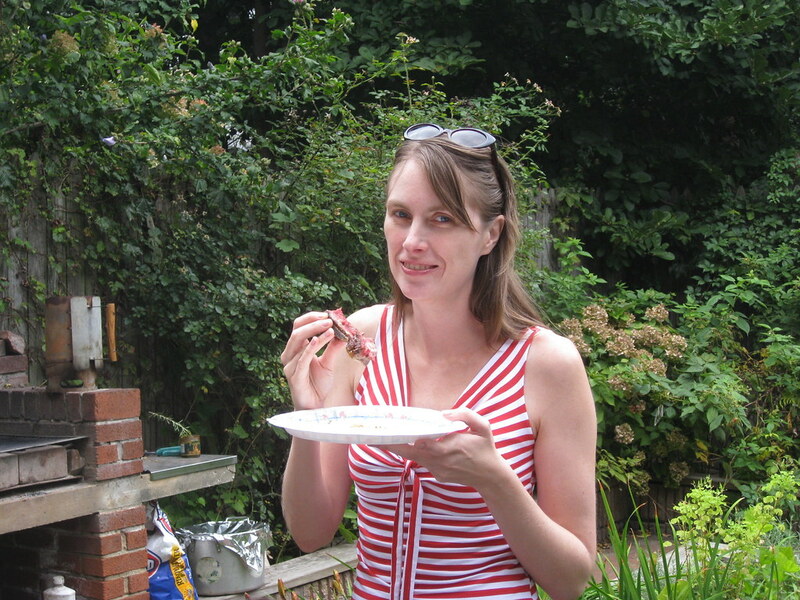 Anyway your picnic looked very yummy, the hot dog and mustard shirt was the capper! If I hadn’t had so much pizza and burgers yesterday, your photos might have made me very hungry. At least I worked some of it off playing wiffleball (sorry, no pics of the “unis”). Today it’s the beaches of Lake Erie, followed eventually by more food. Hope everyone had a great weekend – enjoy your Labor Day! I have the Big Green Egg. For the record, though, I didn’t smoke everything at once — I also have a conventional grill. Was checking something at Internet Movie Database and stumbled on this. Wonder what the unis look like? Buster Crabbe’s in it, too (Olympic swimmer who played Tarzan, Flash Gordon and Buck Rogers in the old cliffhangers and “Captain Gallant of the Foreign Legion” on TV). Paul, your friends are a lot cooler than mine. 1. 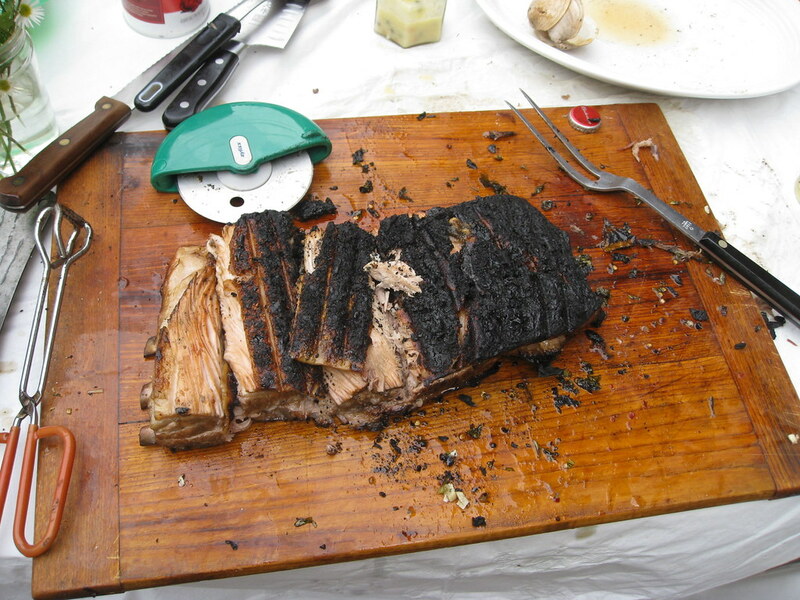 In the crisp-skinned pork belly photo, what is the cutter at the top of the cutting board, with the green handle? I’ve been looking for something like that. 2. My favourite smoker ever was made of an old refrigerator. If you can get a very old fridge with metal rather than plastic inside, they’re not that hard to convert. 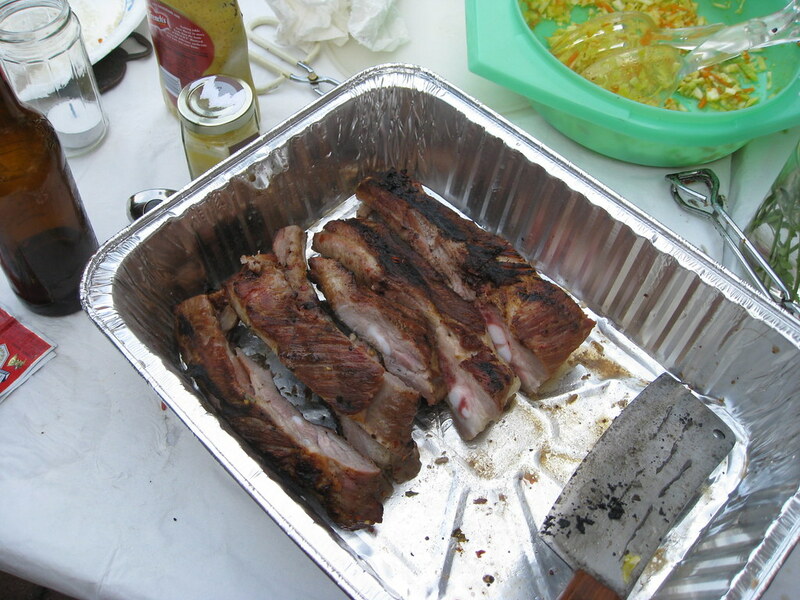 Use the (metal) crisper for the fire, racks for holding the meat, absolutely perfect. I smoked about a million pounds of pickerel and duck in one when I lived in North Ontario, sold it when I moved back to the city. Comes in many colors. Got it as an Xmas gift from my Forewords partner Liz Clayton last winter. Also in that picture is a santoku knife. That’s the first and last time I’ll point out something Asian on Uni Watch before Jeremy Brahm. Nice job with the Budweiser kosher salt, new product from them? 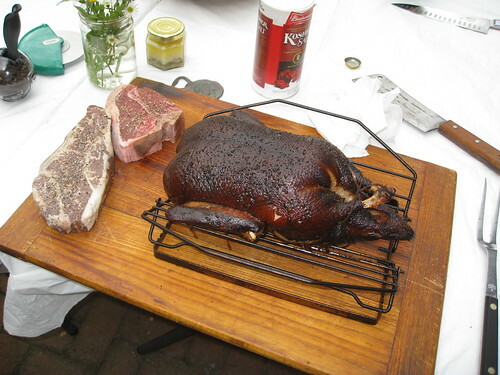 wondering if you were thinking at all about Oregon as you prepared and consumed le duck. Probably not. Which would make that thought a canard. 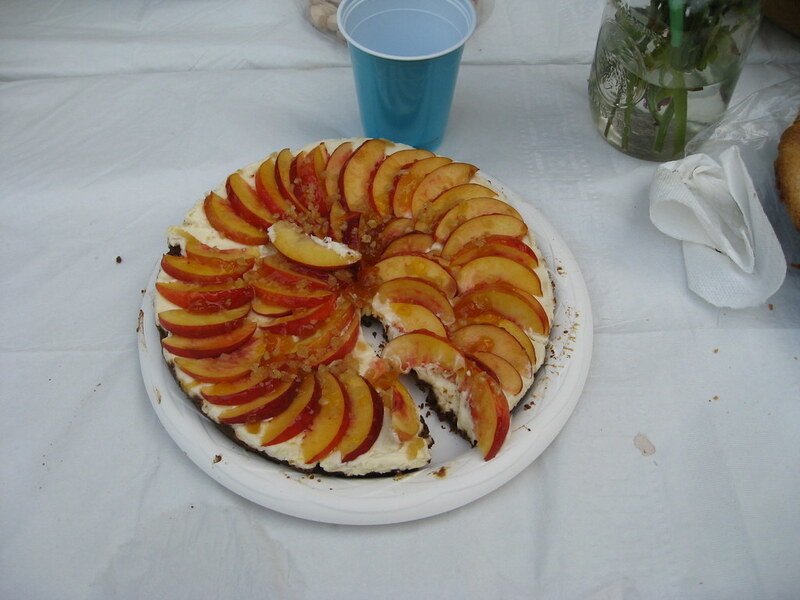 nectarine/mascarpone torte – MY GOD ! 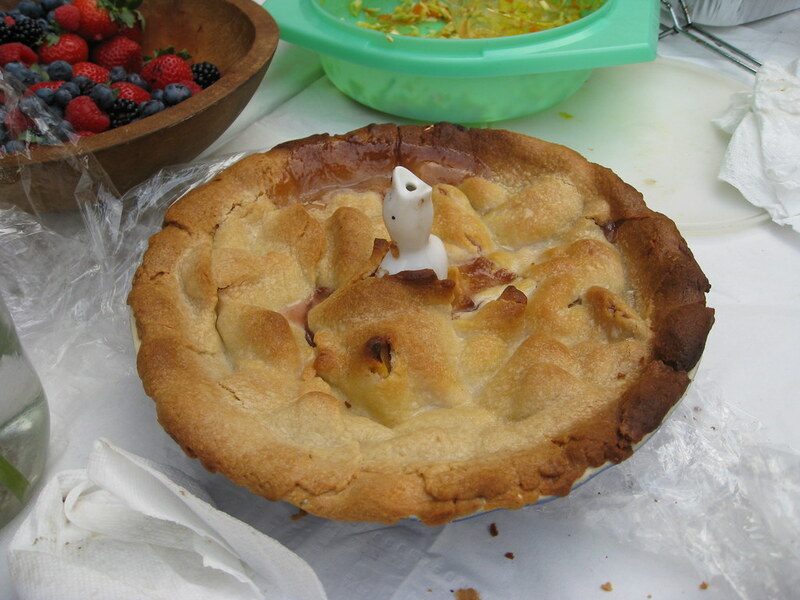 Please provide recipe or whereabouts on how to obtain such a delicacy. I sure wish a Marlins/Mets game was happening today. Strange how both have the holiday off. wow that food looked amazing, i wish i was there. brett gardner is going pants down today in his first game since july 25. didn’t ever wear stirrups but the high socks looked good. Watching the Cincinnati-Rutgers game. Is it just me, or are the Cincinnati uniforms among the worst in all of college football? The pants “striping” looks just horrible. Rutgers, on the other hand, looks great. I know it was a couple days ago now, but watching highlights of the Baylor Wake Forest game I could have sworn that Baylor had a gold helmet for as long as I can remember. Saturday it was white. Yes, I agree about UC’s uniforms. They have been a colossal train-wreck for a long time now. Thank Nike. Baylor now looks almost exactly like Ohio University in the 70s. But not like Baylor, which has been wearing gold helmets almost exclusively since the early ’50s, at least (exactoids please note, I said “almost”). Anybody else remember Cleve Bryant? That’s who I thought of when watching Baylor. 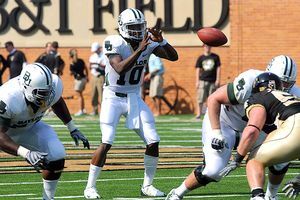 Problem is, he was a QB at Ohio U.
Mike Singletary is rolling over in his grave. Maybe we should say he’s spinning on his stool. They look like a serving of chocolate fudge ripple ice cream. Yes, Baylor did wear a white helmet in the early 1970s, they wore it with a green jersey and gold pants. A couple days ago I had a long rant about why PNC Park needed built. I mentioned that the original design for the stadium included an open end facing downtown. I found a picture here. Scroll about half way down for a side by side picture of the original design and the finished product. I don’t know how fan friendly that park would have been. I’m betting that it would look a whole lot better than Three Rivers Stadium. Indeed they did. No one said they hadn’t worn white. They’ve also worn white pants with gold helmets (see Singletary photo in post #36). But both those combos at least still looked like Baylor, not Ohio U or Marshall. That was the point. Baylor in white pants in 50s and early 60s. Ah, memories of all-time Roughrider receiver (and later Eskimos coach) Hughie Campbell. Even his number his #31 is there. [quote comment=”346262″]Baylor in white pants in 50s and early 60s. Ronnie Bull: another Bear who went on to have a solid career as a Bear. [quote comment=”346266″][quote comment=”346262″]Baylor in white pants in 50s and early 60s. Baylor produced some players who got, and deserved, national noteriety back then…from Del Shofner to Bull to Don Trull, Lawrence Elkins, Singletary and Walter Abercrombie. All of whom wore he white pants-gold helmet version. Most of the retro uniforms the CFL have unveiled this year, has hi-lighted just how ugly the current batch of CFL uniforms are. The Als have a great retro uniform* With the “*” being – that the CFL is plastering advertisements on them as well – just to remind all Canadians the league is aspiring to be the ECHL of football. For their retros, the Al’s are wearing the set with the red wings on the helmets, circa late 50’s, early 60’s, I believe. Some great old CFL footage remembering Sam Etcheverry. Includes silver/gray Al’s jerseys and, of course, a QB wearing #92. Holy Bernie Faloney! This time the Ti-Cats broke out the yellow helmets! Last throwback game they still wore black ones with the TC logo. [quote comment=”346273″]Some great old CFL footage remembering Sam Etcheverry. Includes silver/gray Al’s jerseys and, of course, a QB wearing #92. Very cool, nice jump pass towards the end of the hi-lights. Some of those houses you see in the background at the end are I believe from Taylor Field (Mosaic) – and you can still see them today. (either that of from Ivor Wynne Stadium – and you can still see those houses as well – the CFL has missed a few generations of stadiums. The shade of yellow on the numbers is close to Tampa Bay Buccaneers orange. [quote comment=”346260″]A couple days ago I had a long rant about why PNC Park needed built. I mentioned that the original design for the stadium included an open end facing downtown. This http://www.ballparktour.com/Three_Rivers24.jpg could have put Three Rivers up there with Kauffman Stadium. [quote comment=”346277″][quote comment=”346260″]A couple days ago I had a long rant about why PNC Park needed built. I mentioned that the original design for the stadium included an open end facing downtown. and this couldn’t be built because??? they needed a multipurpose donut instead??? [quote comment=”346278″][quote comment=”346277″][quote comment=”346260″]A couple days ago I had a long rant about why PNC Park needed built. I mentioned that the original design for the stadium included an open end facing downtown. granted, the stillers couldn’t play in either forbes field or pitt stadium as the 70s dawned, and no one (as yet) knew of the horrors of the multipurpose, astroturfed ring-a-ding … but really, some cross between what was proposed and 3 rivers couldn’t have been achieved? the stillers couldn’t play in what could have been the pirates new beauty? damn, imagine if that new pirates palace had been constructed??? Pirates on WGN today. PNC looks pretty damn fine. Can’t figure why it hasn’t helped Pittsburgh’s goal of getting a major league baseball team. Still think Miami’s jerseys look like the Spacely Sprockets house league team. Y’know, all “visionary” and “futuristic”. My mom had some visionary Melmac plates like that in the ’50s. Gold shoes on FSU kicker? 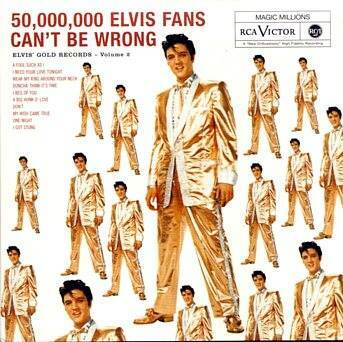 Probably picked ’em up at Graceland. It’s very fine. You should come see a game there. By the way, it’s official – Pirates now assured of a 17th consecutive losing season. The Pirates have averaged a little over 19,000 this year, while down from previous years, still easily beats any annual attendance average from the 1970’s – the real glory years of the franchise. At the end of the day – atmosphere counts. Honestly, every time I see the Pirates on TV, even a highlight, it crosses my mind that it would be good for baseball, and just plain fun, if the Pirates started winning again. Even when they wear those pins. Just don’t think of the Pirates as a pins team (well, except for the bumblebees, where pins were an element not an overall team style). The open-ended version of Three Rivers would have been awful for football. I don’t think we ever saw a stadium that was good for both sports; the concrete ashtrays were adequate for both. PNC Park is nice, Heinz Field really isn’t, but I’d be happier if neither was built by taxpayers. Endive, comparing ’70s baseball attendances with today’s involves comparing turnstile count to tickets sold. That said, the Pirates market and promote much more aggressively than they did in the ’70s, and attendance is generally up around sports. Ricko, the Pirates aren’t a pinstripe team. (The late ’70s stripes certainly weren’t pins.) 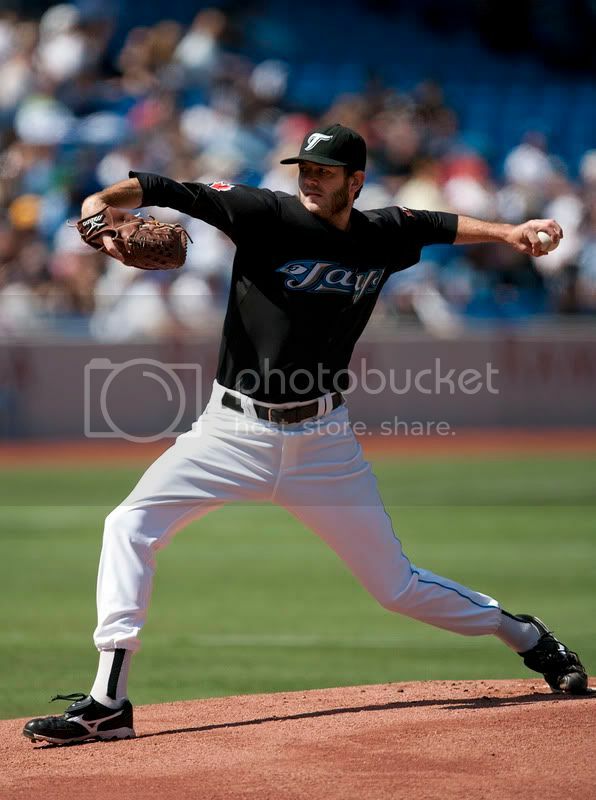 I like the vests better than the current sleeved unis anyway, but the Sunday alts shouldn’t be pinstriped. [quote comment=”346275″][quote comment=”346273″]Some great old CFL footage remembering Sam Etcheverry. Includes silver/gray Al’s jerseys and, of course, a QB wearing #92. My guess is Taylor Field – I don’t think the homes are quite that close at Ivor Wynne. But you’re right, there’s a bunch of very old stadiums in the CFL. A few seconds before that, there’s some footage of Exhibition Stadium with the old north grandstand (the only part of the stadium that the Blue Jays kept) and a brief shot of Pierre Trudeau in his infamous pimp costume. [quote comment=”346287″]The open-ended version of Three Rivers would have been awful for football. I don’t think we ever saw a stadium that was good for both sports; the concrete ashtrays were adequate for both. See, even Pittsburghers think the pins don’t work. not arguing with you but, a question…why not? seating too far from the field (for football) and winds too swirly with open ended field? Hello, Heinz Field is open now. I find it extemely funny that the Rooney family nixed the original proposal for an open ended stadium and went ahead a built one now with Heinz Field. The food looks incredible. That last photo kills me, though. No offense at all, but what is up with your boy’s outfit?? Is it 1954? [quote comment=”346288″][quote comment=”346275″][quote comment=”346273″]Some great old CFL footage remembering Sam Etcheverry. Includes silver/gray Al’s jerseys and, of course, a QB wearing #92. Ivor Wynne is smack dab in the middle of a neighborhood. One end zone and one sideline are right across the street from houses just like those pictured. It’s pretty cool. Don’t know which stadium it is, but it could be either one. you got the beige vintage sweater memo! It’s the difference between a stadium designed specifically for football and one that’s primarily designed for baseball. The building in the drawing is essentially a ballpark; I’m hard-pressed to figure out what the good football seats would be. If they’d built Three Rivers as an ashtray with an open end (like Shea or Oakland), the view would have been nice, but the stadium still would have been no more than adequate, and even less adequate if the seating had gone higher to make up for the lost outfield sections. Baylor had White Pants and Gold helmets for the overwhelming majority of the years 1960-present. 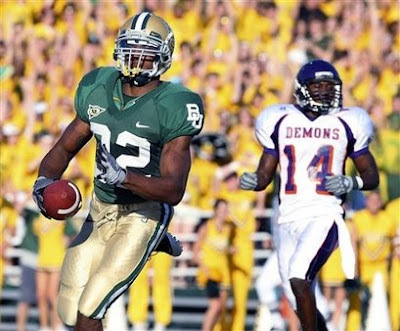 The Gold helmet/Green jersey/White pants was/is a clean, classic look and I would say that particular look was almost exclusively identifiable to Baylor – in a very positive way. Now they sport cheap, cookie-cutter Nike “Uniform Carnival” (as I remember PL describing the Mets some time back in the Village Voice days), with the Vegas Gold jerseys and pants next to useless. COME ON … Get back to looking like Baylor, and get off of the trend trian. Designers these days don’t seem to see the whole board, and understand what may be distinctive and unique and has worked for a team. They apparently simply discount that kind of thing. Their attitude seems to be if something’s been done for a long time it must need changing. They seem to be saying “old” is automatically bad. Yet they’re quick to criticize others, saying. “Oh, you just think anything NEW is bad.” Huh? Isn’t that a serious double standard? Every generation has its group of people who think they were born with the ability to improve everything that has gone before. And of course it will better because THEY did it. Just ask them. Good judgement is a HUGE part of good design. You have to be able to evaluate the context of things, to know what really needs changing and what has worked and should be left alone.